Trucking during the watermelon season. Watermelon yield is being harvested. Welcome to the gold rush! 1. Avoid produce loads! I know it sounds crazy, why would you avoid produce during produce season? Here is the catch; If you have a good dispatcher he will still be able to get you top rates in the areas affected by the season without exposing you to the risks associated with hauling produce. The freight rates go up not because truck pulls watermelons but because of supply and demand and if a customer wants his goods shipped they will have to offer as much as produce shippers. The goal is to haul easy freight for top rates and leave all the headaches for competitors. 2. Seasonal problems. Here are some reasons to avoid the produce: **Loading and unloading times. Sometimes it takes a day to get loaded if it starts raining it can take two days just to get out of the field. Due to very sensitive deadlines of perishables trucks are being ordered while the shipment is still out in the fields. **Critical delivery deadlines. Forget about easy first come, first serve, and get ready for all kind appointments, lumpers, produce inspections, rejections, shortages and damages, and unreasonable back charges. And yes they can legally do this. Up to 50% of produce loads ends with some issues from claims to just some minor inconveniences. 3. Money is money. Sometimes money talks and you will have to walk. If you end up taking a produce load make sure it is in a prime state, loaded correctly, and looks like it will make it to the delivery in same shape and form as it was when loaded. Keep communication at 100% on any issues. Make sure the BOL is properly signed and clean, meaning no shortages, damages, or quality issues noted. 4. It is not uncommon to receive a produce and submit a cargo claim on everything that didn’t sell. They have six months to file a claim. Is it insurance fraud? Yes. Does anybody care and are willing to investigate? Nope. Unfortunately some businesses are using this loophole, not all. 5. Watch out for double stacked bins. Bent bins with perfectly fine watermelons in them can cause a claim if delivering to a wrong place. Conclusion: work with your dispatch, use the hot areas to your advantage and stay away from trouble and unnecessary risk exposure. Had any good, bad or ugly experiences with produce loads? We would love to hear your stories in the comment section below. Drive safe supertruckers. Disclaimer: By posting you hereby agree to the terms and conditions that follow, we are not responsible for any illegal or offensive content . The administrator may at any time remove comments that have explicit use of words and strong language. Thanks for posting. 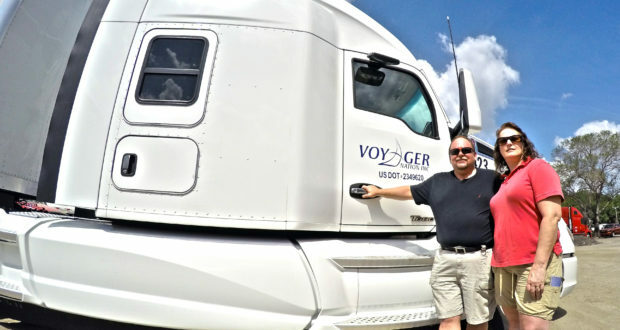 ​When is the best time to buy a truck and become an owner operator? Did You See Your Driving Record Lately? Trucking in 2016 according to experts. Subscribe to receive our free newsletter!